Disney Educational made a short film in 1983 that depicts the devil and an angel arguing over whether a young woman should learn about computers. It’s called “Computers: The Truth of the Matter,” and I got to see it at the Oddball Films archive on Friday as part of a screening of retro-computing shorts. I looked it up online later and found basically nothing, so I thought I’d write up a few words for future searchers. The film starts with the young woman Jessica slipping into her school’s computer lab, excited for a few quiet moments alone to work with the machines. Her practice time is interrupted a second later when Luke, a devil-figure in a red fedora, appears in a puff of smoke and starts trying to dissuade her from learning, arguing that computers are hard and not really that useful anyway. A minute later, the classroom door opens and blinding light appears behind it. 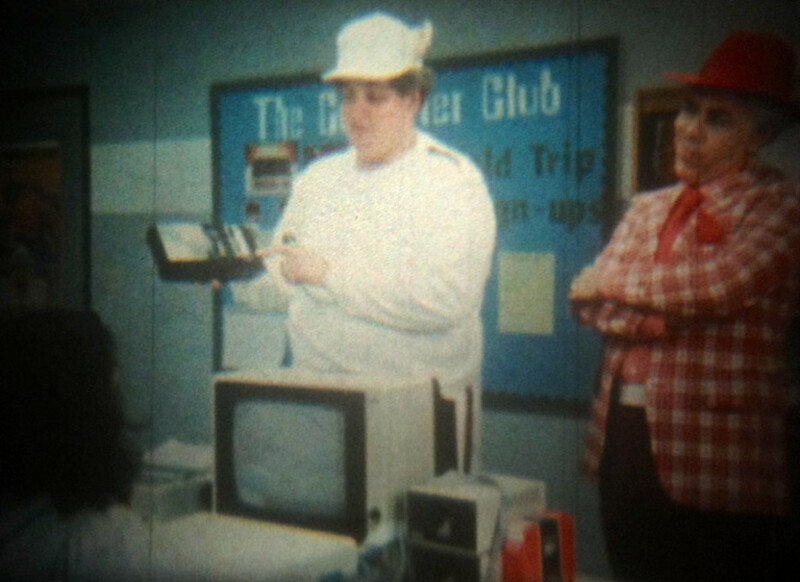 Angelo, a chubby guy in white gold-trimmed sweats and a winged baseball cap steps out to argue the opposite, that computers are worthwhile to learn. When Jessica shows interest, he pulls her in and they teleport around seeing the applications of computer systems, and then back into the classroom to talk about input devices, CPUs, and output devices like displays and printers. At one point he shrinks the two of them down to walk on top of a microprocessor. Throughout this, the devil figure keeps interjecting that she doesn’t really want to learn, that computers are unpredictable, and so forth. Eventually Jessica’s convinced, and the devil zaps out of the classroom. In the last shot, we see him at a fiery desk counting the tally at this point: millions of converts for Angelo, zero for himself. Of course, he’s keeping the tally on a computer. When he sees the camera come in, he tries denying it, saying he was watching TV and typing a letter. The movie is funny in a bit of a forced way, and of course very little of the substantive material “holds up,” in the sense that it would be useful educational material in a computer class today. The high level stuff is still correct, but the examples are decades out of date. But I couldn’t disagree more with the folks in, say, this forum thread who claim that it’s no longer relevant and so shouldn’t be prioritized for re-release. Films like “The Truth of the Matter” have a really important place in the history of computers. It’s remarkable to see the lessons it teaches, not because of the content itself but because of what it says about what was once assumed, or needed to be explicit. One line in this movie that caught me by surprise was when it showed a student working on a term paper, and the narrator remarked that even though it would get corrections and multiple drafts, she would only need to type it up once. Surely it’s worth something to get a glimpse into a world where that was a point that needed to be made.